TifSport can only be sold as certified sod or sprigs and is regulated by each state Seed Certification Agency. The certification certificate below is your supplier's assurance that the TifSport you purchase was grown by a licensed producer in accordance with established standards. 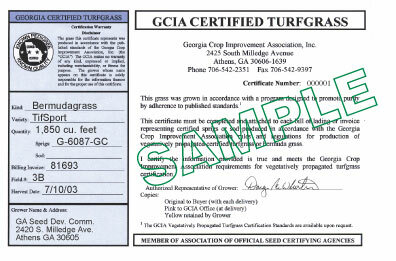 Be sure to ask for a certification certificate when your TifSport sod or sprigs are delivered.